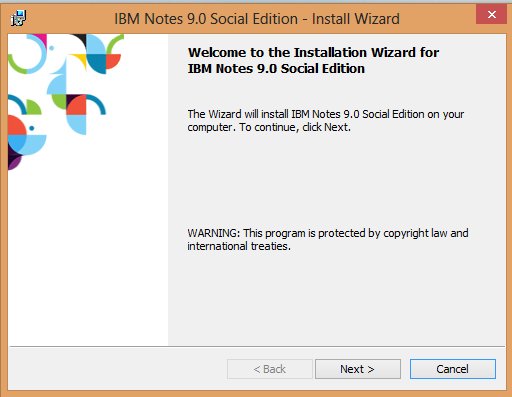 In this series of posts we are going to walk through all the new capabilities contained within the latest release of IBM Lotus Notes, or rather - the newly reincarnated IBM Notes 9. 17 years after the acquisition of Lotus Development Corporation, IBM has dropped the "Lotus" from the branding of the product, finally bringing Notes completely under the IBM brand umbrella and heralding a new era for the most powerful desktop application available. A raft of new features and capabilities have been introduced with the new Notes, which I will be discussing in future posts. 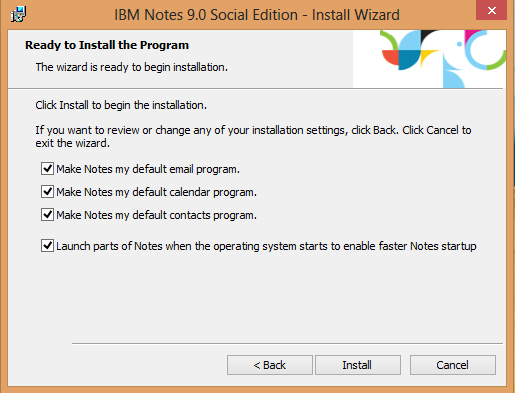 The first step on your IBM Notes 9 journey is - of course - installing and configuring the software ... let's begin. 2. 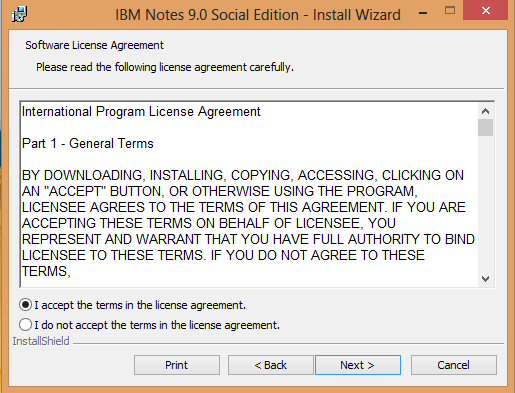 The 'IBM Notes 9.0 Social Edition - Install Wizard' dialog will be presented, click "Next"
3. Review and Accept the terms of the licence agreement by choosing "I accept the terms in the license agreement" and click "Next"
4. Installation paths, note that because I'm not using the "Client Only" installer I don't have the multi-user option available*. Choose your path's and click "Next"
5. Choose Installation options. In this step I have selected all features except single logon, including the full Design and Admin clients, and the NEW "Notes Browser Plug-in" and "OpenSocial Component" options. Select your features and Click "Next"
6. When Notes is installed, I want to use the application as my default Mail, Calendar and Contacts application, as well as speeding up the start-up process by selecting "Launch parts of Notes...". Click "Install"
8. After the installer has completed the 'success' screen will be displayed, Click "Finish"
14. 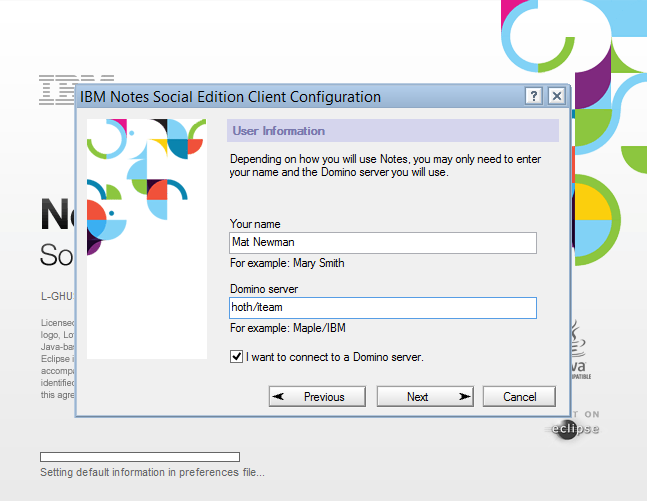 Enter your IBM Notes username and 'home' Domino server (ask your help-desk if you're not sure what these are), click "Next"
15. If the information at step 14 (user information) is entered correctly, you will be prompted for your IBM Notes User ID Password, enter your password and click "Log In"
16. Notes has features which enable you to connect your Notes client to a variety of other Internet services, these can be configured now or later. I'm going to configure them later ... click "Next"
18. 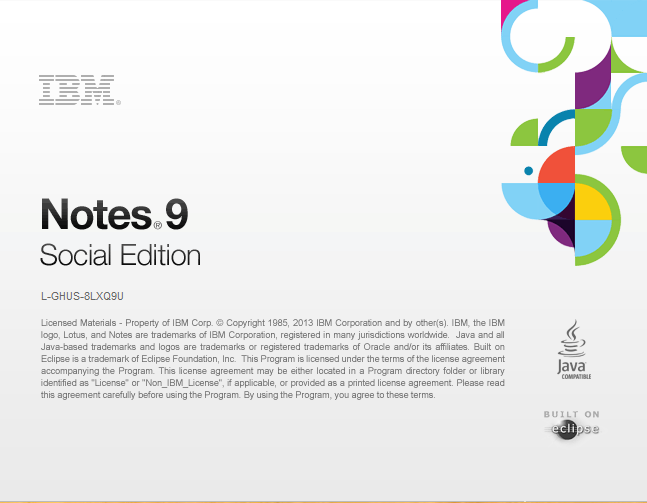 VOILA - IBM Notes 9 installed and configured! 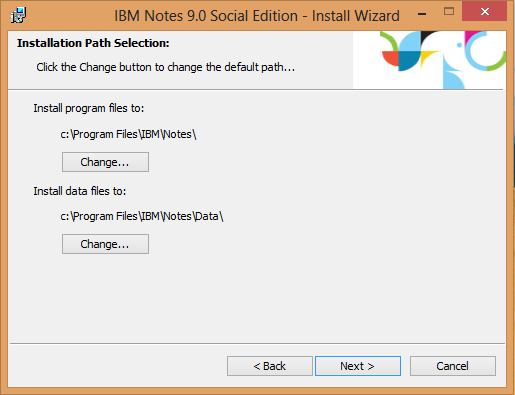 * The multi-user install option places the users IBM Notes 9 personal data within their Windows profile path, and is only available with the Client Only install, which does not include Domino Designer or Administrator clients. 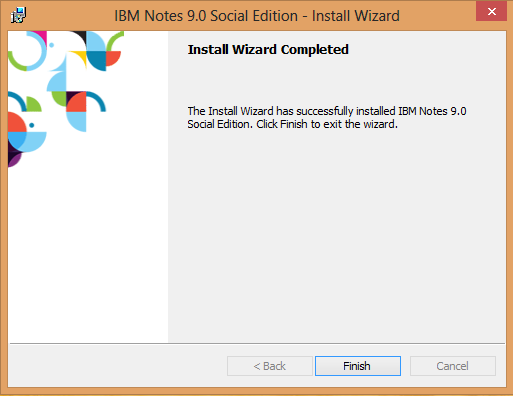 So there we are, IBM Notes 9 from-zero-to-hero, the installation and configuration process. You do this so well, Mat. Now if someone would do the same friggin thing for Connections and Sametime. Pictures are good! I found that if I didn't uninstall 853 (using the Remove option from the 853 installer) and UP1 (through Windows), the Notes 9 installer failed part way through and wiped out my 853 installation (including the INI file). It left pieces of itself in the registry which took a while to find and remove. One machine worked fine after doing the uninstall and one did not when I skipped that step. @1, Lars & @2, Jesper: Thanks guys. @3, Jim: Have you checked out Connections101.net (http://www.connections101.net/) created and maintained by Gabriella Davis and Paul Mooney? 1. 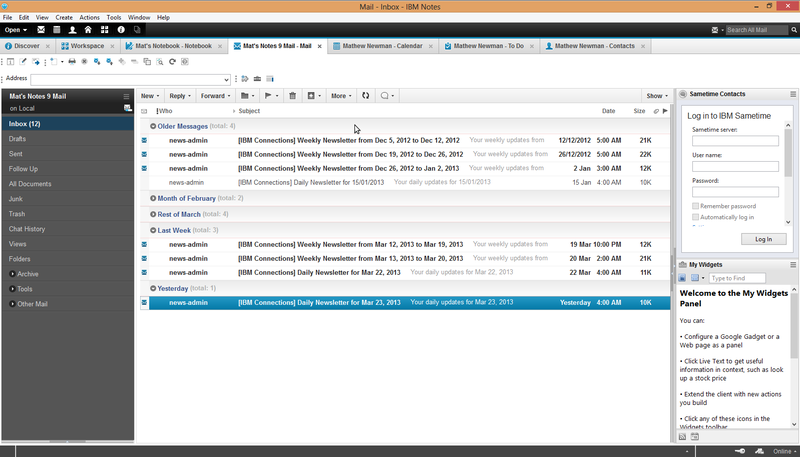 Now outlook is the mail client being used. After installing Notes, will outlook still work? 2. Client single logon feature?? To configure Smart cloud Notes account in Notes client,Make sure that 'id file' is downloaded to the Notes data directory after configuration of account. It will take maximum 8 days to get downloaded to the notes data directory in smart.The end user needs to stay in the location document for minimum amount of time to get the id file get downloaded to the note client. what about the duration mean? Can't we access until 8 days? Also, what does stay in the location mean? 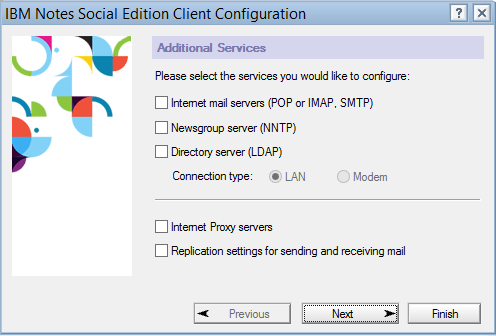 Can we use exchange server in use for outlook client to the notes 9 we've installed now? @8, Vijay: Outlook will still work as configured. Yes Client Single Login is an installation choice, I choose not to use it. Where did your figure for '8 days' come from for SmartCloud Notes? Exchange is the server for Outlook. Domino is the Server for Notes. Do you need help migrating your Exchange Servers to Domino? 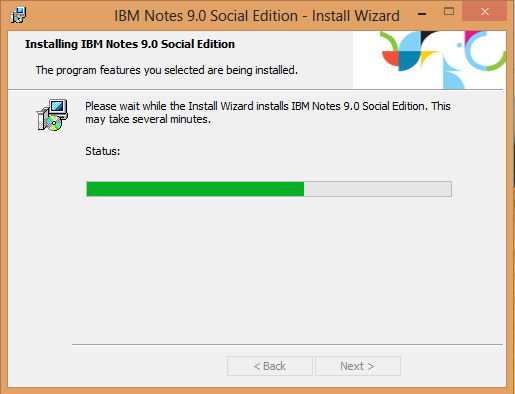 Did you already tested if Notes 9 also works under MS Windows 8? We also have some databases onder Notes like relations en projects database which I would like to use on a tablet with Windows 8. @10, Yvo: The screen shots in this post were actually taken using Windows 8 as the installation host. If you're looking to install Notes 9 on a Win8 tablet, you need to make sure the Tablet is running a version of Windows 8 other than RT. RT does *NOT* allow installation/running 'traditional' Windows applications. For example, if you are considering a Surface, you *MUST* choose the 'Pro' version. HTH. 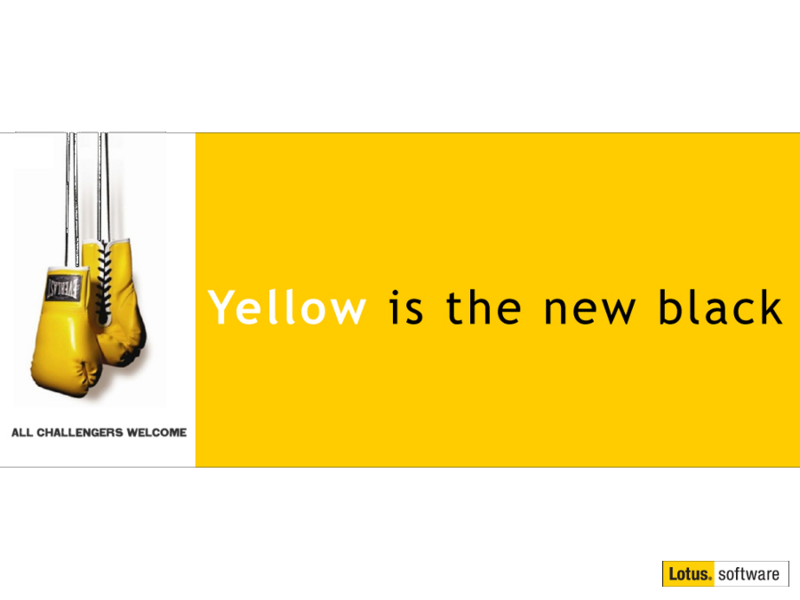 good job - and I really like the yellow colour here ;-) Good to see not everything's blue these days. Question regards "single logon feature" - I thought this has been removed from 8.5.3 onwards as it didn't work properly? I am not 100% sure but I think I saw a technote somewhere saying that it shouldn't have been part of 8.5.x installers anyhow? @13, Stefan: The "Notes Single Login" feature was removed to cater for the new Domino Policy based Single-Sign-On process. IBM changed the way it works so it's no longer just a password sync process, it's true SSO. HTH. I am really impressed with your post. and one more thing, If I don't connect to a Domino server, what will happen ? Hi Mat - is it possible to run both Notes 9 and Notes 8.5 clients concurrently? If not, if I decide to remove Notes 9, will my old Notes 8.5 client settings be preserved? 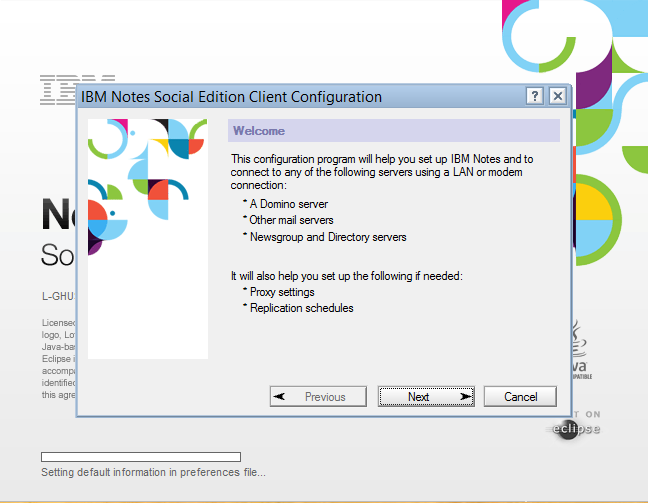 any problems reported running a Notes 9 client against an 853 server? When I try to open Mail in Notes9 under MacOS X connected to domino 8.5.3 - it crashes. Other things work perfectly (calendar, contacts etc). Can it be the matter of mail template? 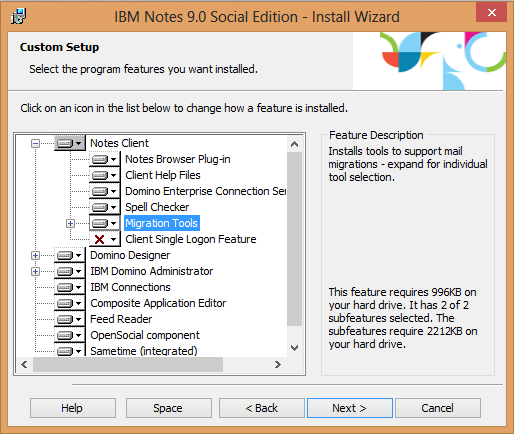 Has anyone successful connection from Notes 9 to Domino 8.5.3? I know this is an old thread, but I am having same issue as 'Araza' above. I cannot find this client on the IBM website. I have downloaded the standard client minus the Admin/Designer functions but that does not help. Anyone know how to get this? 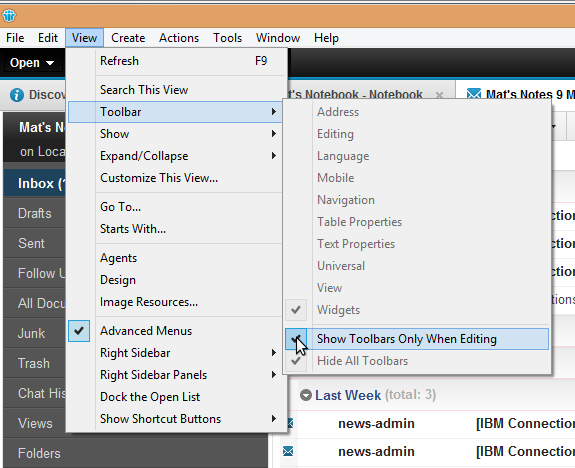 Its available in IBM web site. "you are currently trying to level a multi-user installation. Please obtain the correct setup to finish setting a level"
Could you give some suggestions please. Hi Matt - tried to install but before it finished, after the Notes9 box came up...it stopped...message said I have to have Domino installed first on this computer... ideas? I want to use Notes 9 just privat. So no Domino. What Setti?gs would it Need to use an IMAP mail? I have been able to connect, however the look was very much differen with IMAP9020.nsf that was created during Setup. when manually starting a new folger with mail9.ntf as a template I get the nicer design and also a calender etc. however I cannot get the mail to sync with my IMAP mail account into that application. We have always used a network share for our data directory and now when installing designer for R9 it fails. Does anyone else use this scenario and found a work around? How can I rename the name in my contacts?